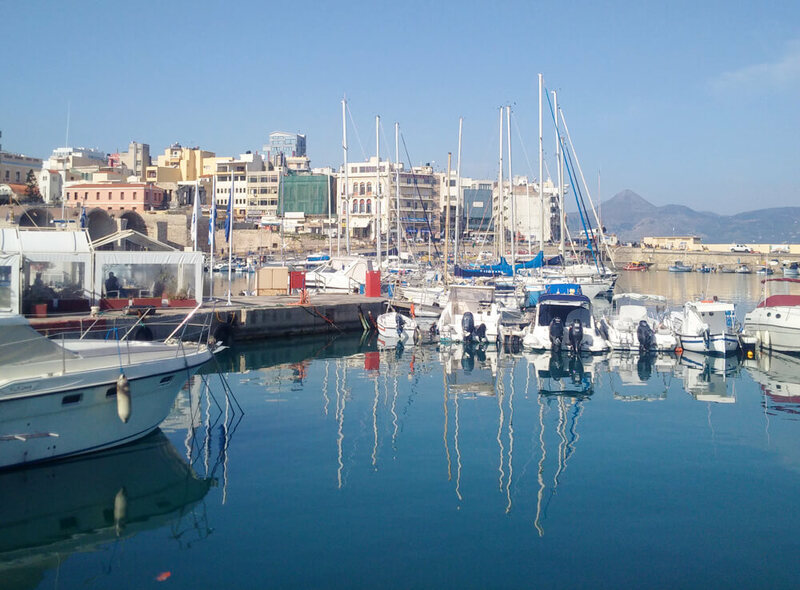 We can organize your private tour, arrange a licensed travel guide and make your visit in Heraklion, Crete’s capital city, a unique experience.Visiting Heraklion for the first time, the visitor nowadays may be surprised by the changes that are taking place there. Over the past years the infrastructure of the city has been improved, pedestrian streets give to the guests the opportunity to walk through the city and enjoy the monuments. Heraklion nowadays balances between the fast moving currents of regeneration and a deep desire to maintain links with its past, its tradition. This is what defines the city of Heraklion. The ‘old town’ parts of the city, that date back to Venetian times, now offer visitors some fantastic walks in the heart of the city. 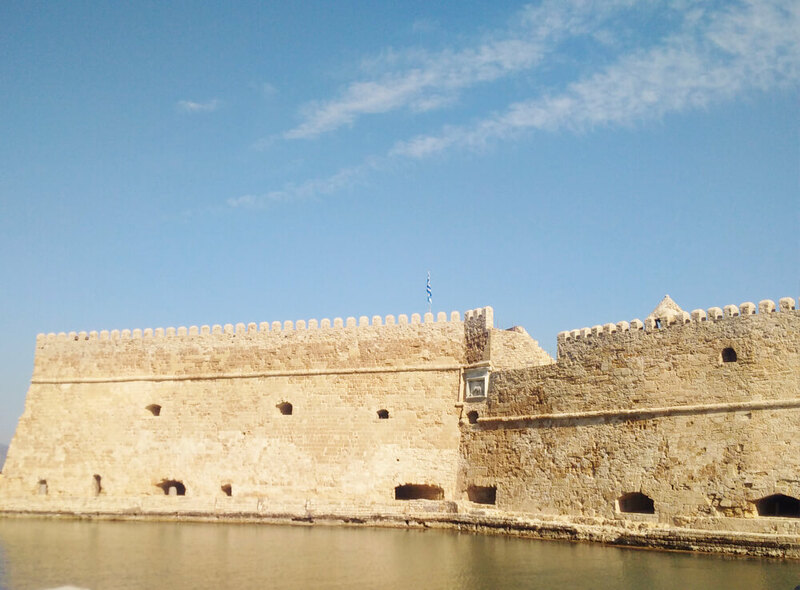 If you begin a walk together with your private tour guide around Heraklion, starting at the fishing harbor close to the modern port, what will strike you first is the Venetian fortress at the gate of the small harbor. The fortress was originally built by the Venetians and was known as Rocca al Mare, but the locals use the Turkish name which is Koules. For many centuries it was used to protect against invasions, as were the impressive city walls and moat gaps. These are among the longest city walls of Venetian cities of the Mediterranean. Nowadays you can enjoy a stroll along the beach, starting from the port, you can reach the commercial center of Talos, and then continue, following the walls till the Bastion of Martinengo (where the famous author of Zorbas the Greek was buried, N. Kazantzakis). During your private tour in Heraklion take pictures of the Venetian Arsenals and use the pedestrian street of 25th August street to reach the Lions fountain at Venizelou sq. The street takes its name from the events of 1898 during the War against the Ottomans. Walking up the short hill, and passing the shops and tourist offices, we reach St. Titus’ Cathedral, an impressive sight worth visiting while being on a private tour in Heraklion. Saint Titus, a fellow traveller of Saint Paul, preached the gospel in Crete during Roman rule and was martyred in Gortyn, where a 7th Century basilica stands in his memory. His church in Heraklion was built during the second Byzantine period, when it first served as the city’s cathedral. During Venetian rule, it housed the seat of the Catholic archbishop and was renovated in 1466, only to be ruined by fire in 1544. During the Turkish Occupation it served as a mosque and called Vizier Tzami, when a minaret was added, which did not survive down to the present. The present-day structure is the result of further renovations after its almost entire destruction by the devastating earthquake of 1856. The relics of St. Titus were transferred here from Venice in 1956 and have since then been kept in the narthex of the church. If St. Titus church is open during your visit, it is worth going in. A little further and your private tourist guide will help you discover the Venetian architecture of the Loggia which functioned as a club for the nobility to gather and relax. The Loggia is a wonderful example of Venetian architecture, it was built in the 16th century and was located in the Piazza dei Signori (Square of the Administrative Authorities), and was fully renovated after the Second World War. Today, the Loggia, decorated with sculptured coat of arms, trophies and metopes, houses part of the town-hall of Heraklion. The Basilica of St. Marcus patron saint of the Venetian is now the Municipal Art Gallery of Heraklion and often hosts art exhibitions, open to the public. Built in 1239 in the Piazza delle Biade (Square of Blades), it was at the time, the Cathedral of Crete. It is the heart of Heraklion and a meeting point, something you can find out on your private tour in Heraklion. The decorated fountain is composed of eight cisterns and decorated with stone relief, depicting figures of Greek mythology, Nymphs, Tritons, sea monsters and dolphins, while the main basin is supported by four sitting lions balancing a circular bowl on their heads. It was constructed during the rule of Francesco Morosini, the Venetian governor who had it built, as a part of a general plan to improve the infrastructure of the city and connect the water cisterns with the aqueduct of Mount Youchtas. Our tourist guide can give you further information as you walk slowly through the Agora, the Market Street that runs alongside a shopping boulevard called 1866, after a Cretan uprising. On your private tour in Heraklion don’t miss out trying local produce. From top to bottom, this old Market Street (recently renovated) is still a place for the citizens of Heraklion to come every day to find local products spices and herbs, fish and fresh meat. It’s a good place to find thyme honey, raki (the Cretan clear spirit) and fine cheese. Walk the side-streets and you will find some local taverns and restaurants. 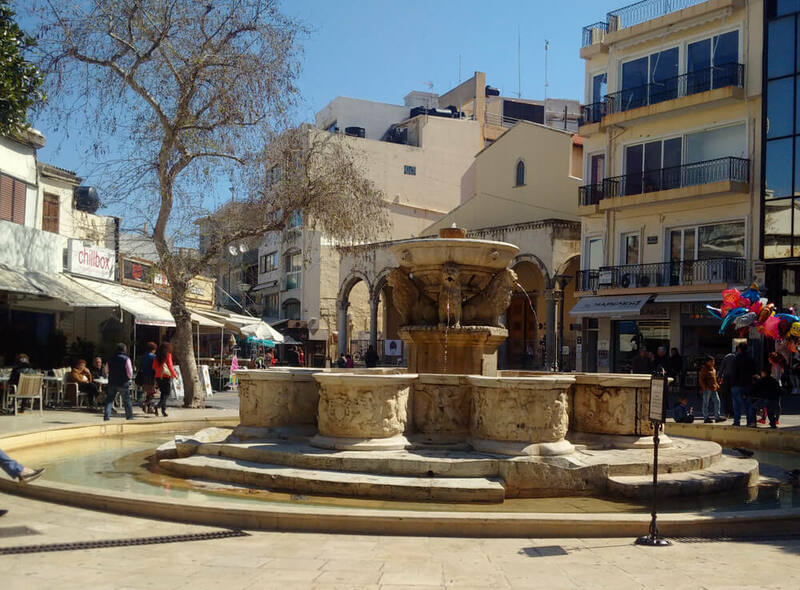 The market street leads to Plateia Kornarou, Kornaros sq, with a lovely Venetian fountain known as the Bembo Fountain, with interesting decoration. The Bembo Fountain was built in 1588 by Venetian architect Zuanne Bembo. It is decorated with columns, Venetian family coats-of-arms and a headless male statue, brought here from Ierapetra. The Plateia – square itself is named after Vitsenzos Kornaros, composer of the epic poem Erotokritos, which is regularly performed around Crete during local festivals. The cathedral, dedicated to the Patron Saint of Heraklion and one of Greece’s largest churches, completed in a cruciform shape with twin towers. The church suffered damage in the battles for the city and needed thirty years to be rebuilt. The square around also contains a wonderful collection of religious icon paintings, housed inside the strong walls of the much older church of Agios Minas, and the Basilica of Agia Ekaterini, (Saint Katherine) built in 1555 and the site of a renowned school of Renaissance painters and writers in the 16th and 17th Centuries. Inside the church can be seen the work of Mikail Damaskinos among other representatives of the Cretan School. The Plateia Eleftherias is situated near the Archaeological Museum and close to Heraklion’s municipal buildings and the main foreign Consulates. Apart from breathing space, nearby is a small park of Georgiades, a fine place to rest the feet and watch the busiest intersection in Heraklion. All busses visiting Knossos during summer season stop near the park, by the main street, where you will be able to see a statue of El. Venizelos. Your private tour guide will show you around the world famous Heraklion Archaeological Museum that was built between 1937 and 1940 on a site that had been occupied during the Venetian Period by an imposing Catholic monastery of St. Francis, which was destroyed by the earthquake of 1856. The Museum houses archaeological finds from all over Crete. Most important exhibits belong to the earliest European civilization, the Minoan. The building was under renovation and until recently only a small part was open to the public. Nowadays the renovation work has been completed and slowly the new Museum opens its new spacious rooms with the original finds of the excavations of Crete. 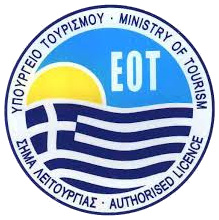 Definitely a must see museum during your private tour in Heraklion. Another site you can chose to visit while being on a private tour is the Historical Museum of Heraklion, at Sof. Venizelos street. The museum was founded in 1952. It houses important examples of early Christian artifacts, stonework and decorative objects of Roman, Arab, Byzantine, Venetian and Turkish origin. There is a panoramic wooden model of mediaeval Heraklion, or Candia as it was called by the Venetians (after its Arabic name El Khandak) in one room, beautifully detailed, will give you an idea of the size of the city during Venetian times. (At the wooden model there are push-button spotlights picking out the locations of many important sites of worship, defense and government, very detailed information points).